fiberwerx 7" , I am running 11 - 14 raptor Camburg LCA+ SVC offroad UCA Mid Travel Kits. 15+ f150 Baja Kit is a little bit wider than my Camburg kit, about 1" wider on each side? Can't really remember now. I am running - 44mm Method Beadlock which push the track width out about 1.73" each side ( 1.73" compare to a 0mm offset wheel) . If you run a baja kits mid travel with Method Beadlock -44mm. Your truck will look the exactly same as mine. BTW, I am running 37"tire , maybe it is wider than 33" ? You can check it online. Last edited by LuSun Prerun; 02-12-2019 at 03:29 PM. oh okay, I thought you had a long travel kit. I think the Baja kit is 3.25 wider per side. I do have method beadlocks but they’re 0 offset on 35’s and will eventually get 37’s. I didn’t know they made one with a -44. Your truck looks sick btw. 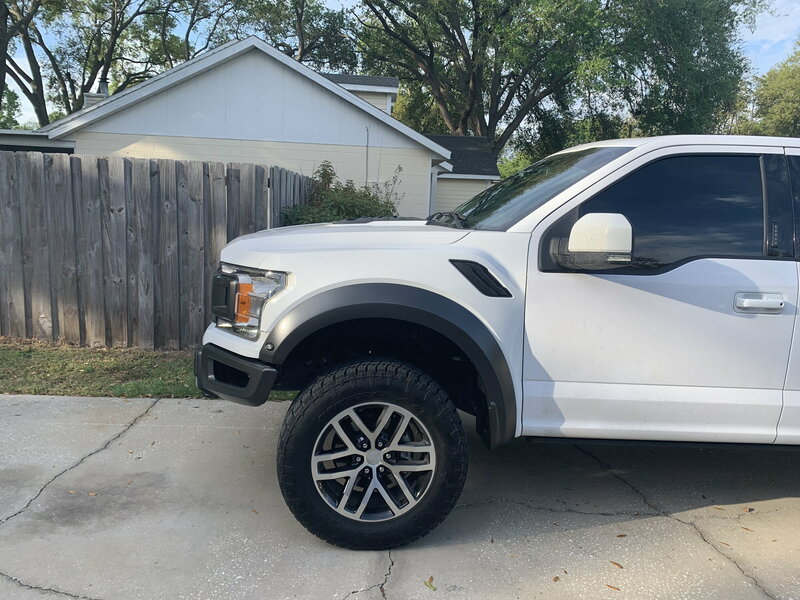 Ok so after spending a week on the ford raptor forum. Correct parts are ordered. Hey I have a 2017 and am looking at doing the raptor conversion like you did. But I have a question, with using the gen 1 raptor coilovers in the front, do you have to use the little spacers that the gen 1 Raptors do? Where they tilt the shock to fit in the lower control arm? Or do you just put the shock in like normal line up the top 3 studs through the holes and put the nuts on and are good to go? looking good! Just going to tap into headlight harness for the fender flare marker light? You going to replace the headlights? I didn't think the 2018 headlights would fit. What about the missing piece under the grill? the lower trim will take a good amount of custom work! flowmasters40, I was wondering if you could post more pictures and or info on your progress. I am also planning on converting my 2018 into a raptor. I have most of the body parts. You can post or email, anything would be beneficial so I am able to have as little downtime as possible. 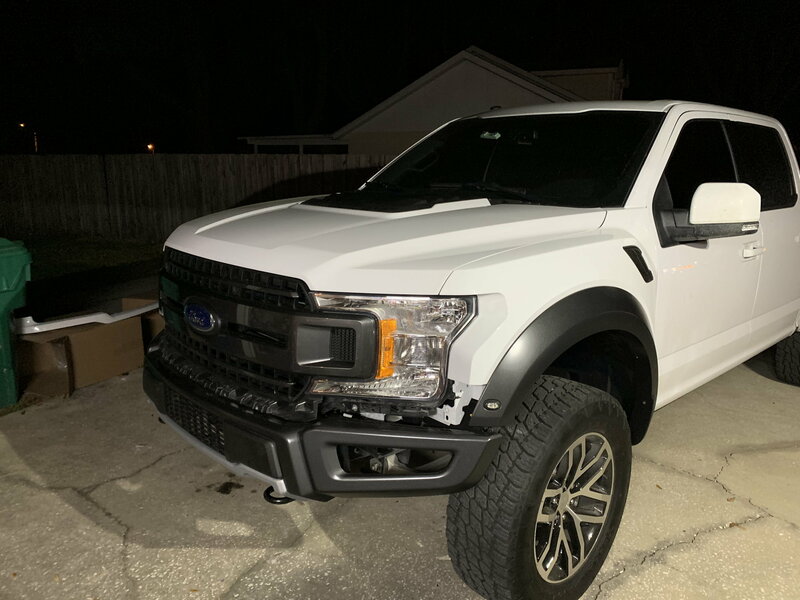 I plan on using the original headlights but I might use the raptor grill and make infill parts from aluminum. I was wondering if the outer edge of the raptor headlight molding would still fit and splice two original under grille moulding? Last edited by Rory Hebel; 03-09-2019 at 05:27 PM. So to be honest my original plan was to do the same. Run the 19 grill and headlights. But after realizing how much custom work it is going to take i decided to run 17 led oem lights with oem raptor front end. I am **** as hell and it would just bother me if things don’t line up like they should.